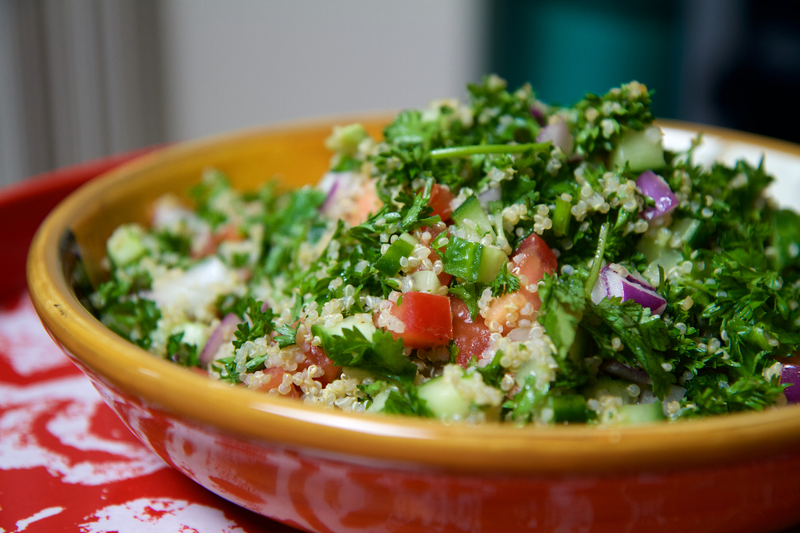 Traditionally tabouli (or Tabouleh) is made with couscous, or bulgar wheat. I wanted to make this tabouli gluten-free so i’ve substituted the couscous (or bulgar) with quinoa. This salad is very light and is a great summer side to any main dish. The only way this tabouli could taste even better is if the fresh herbs and ripe tomatoes came directly from your summer garden. Use a mesh colander to rinse 1 cup quinoa before cooking. Transfer to a cooking pot and add ½ cups of water. Bring to a boil, cover the lid then bring heat back down and let it simmer for 15 minutes. Remove the quinoa from the hot burner and let sit for 5 minutes. Remove the lid and fluff with a fork. Let it cool in the fridge. Mix all the ingredients together in a large bowl once the quinoa has cooled down. Tip: you can use Italian parsley if you prefer but curly parsley always looks nicer especially if you’re entertaining guests. Enjoy!